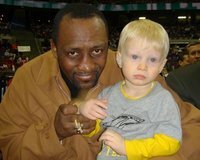 I certainly didn't think that my (almost) 2-year-old son was in any danger when I let him sit on the lap of seven-time world champion boxer Tommy "The Hitman" Hearns last week at the Detroit Pistons basketball game at the Palace of Auburn Hills. 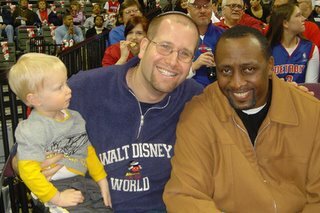 But I was certainly shocked and upset to read today that Tommy Hearns was arraigned on assualt and battery charges after allegedly assaulting his own 13-year-old son. Had "The Hitman" so much as looked at my kid wrong, no doubt I would have KO'd him -- I have a deceivingly strong right hook for a rabbi... don't be fooled! Thomas Hearns, a a seven-time world boxing champion, is expected to go before a judge Friday in a preliminary exam on charges he assaulted his 13-year old son Monday. Hearns, 47, was arraigned Monday before 46th District Magistrate Eugene Friedman in Southfield and charged with misdemeanor assault and battery. He was released on $10,000 personal bond Monday and ordered to have no contact with his son. Police arrived at Hearns’ house in the 20500-block of Norwood in Southfield at about 6:45 p.m. Sunday, after receiving a call from Hearns’ wife, who said there had been a domestic dispute. The teenage boy had a swollen eye and a small cut on his chin, Southfield Police Detective John Harris said. Harris said Hearns apparently told the boy to go to another room; the teen refused and there was a scuffle. But, Harris said, Hearns and his wife gave slightly different accounts of how the boy was injured. Police arrested Hearns and took him into custody until he was released on bond. Hearns could not be reached Tuesday for comment. He is to face district Judge Sheila Johnson on Friday. A court clerk said Tuesday that Hearns attorney had not been identified yet in the file. Not Sweet Tommy! The situation with his son was more than likely blown out of proportion. When tensions are running high, sometimes we overreact in a way in which we normally would not, and end up regretting. Tommy wouldn't hurt a fly!